reached his eleventy-first birthday he disappeared, bequeathing to his young cousin Frodo the Ruling Ring and a perilous quest: to journey across Middle-earth, deep into the shadow of the Dark Lord, and destroy the Ring by casting it into the Cracks of Doom. 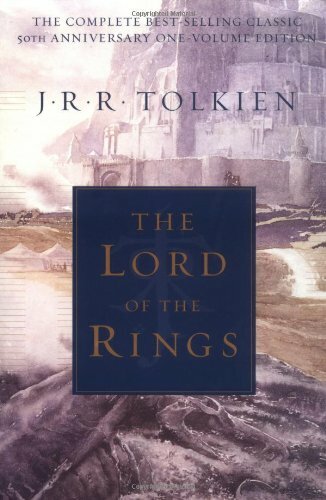 The Lord of the Rings tells of the great quest undertaken by Frodo and the Fellowship of the Ring: Gandalf the Wizard; the hobbits Merry, Pippin, and Sam; Gimli the Dwarf; Legolas the Elf; Boromir of Gondor; and a tall, mysterious stranger called Strider. This new edition includes the fiftieth-anniversary fully corrected text setting and, for the first time, an extensive new index. J.R.R. Tolkien (1892-1973), beloved throughout the world as the creator of The Hobbit, The Lord of the Rings, and The Silmarillion, was a professor of Anglo-Saxon at Oxford, a fellow of Pembroke College, and a fellow of Merton College until his retirement in 1959. His chief interest was the linguistic aspects of the early English writtentradition, but while he studied classic works of the past, he was creating a set of his own. singer of songs, one of the multitude of characters in his romance, saga, epic, or fairy tales about his country of the Hobbits. Tolkien was also a formidable medieval scholar, as evidenced by his work, Beowulf: The Monster and the Critics (1936) and his edition of Anciene Wisse: English Text of the Anciene Riwle. Among his works published posthumously, are The Legend of Sigurd and Gudrï¿½n and The Fall of Arthur, which was edited by his son, Christopher. In 2013, his title, The Hobbit (Movie Tie-In) made The New York Times Best Seller List.